I am an Adobe Customer. I have purchased their products. I have an account with Adobe. 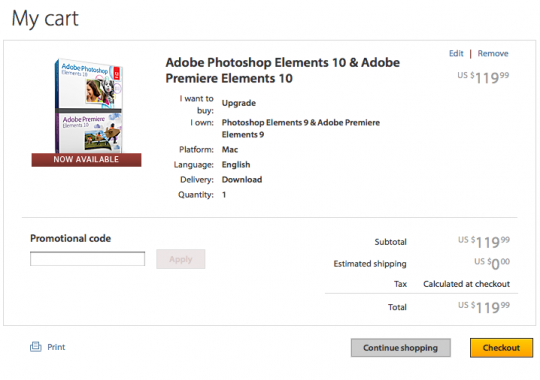 I was going to upgrade to Adobe Photoshop Elements 10 and Adobe Premiere Elements 10 today. My Australian Adobe account requires me to pay $185.00AUD for the upgrade. Given that the current AUD/USD exchange rate is 0.9777 the price disparity for the upgrade is ridiculous. I have a mind to contact Fair Trading NSW at this link. Report a scam. The identical download file costs $185.00AUD if I use an Australian Adobe account and $119.00USD ($121.71AUD) if I use an American Adobe account. That is a difference of $63.29AUD. That is a significant markup for a file download. No packaging and transportation costs involved. A file download that costs $AUD63.29 additional due to where I live. That is an increase of 52%. Some would label this “piracy”. 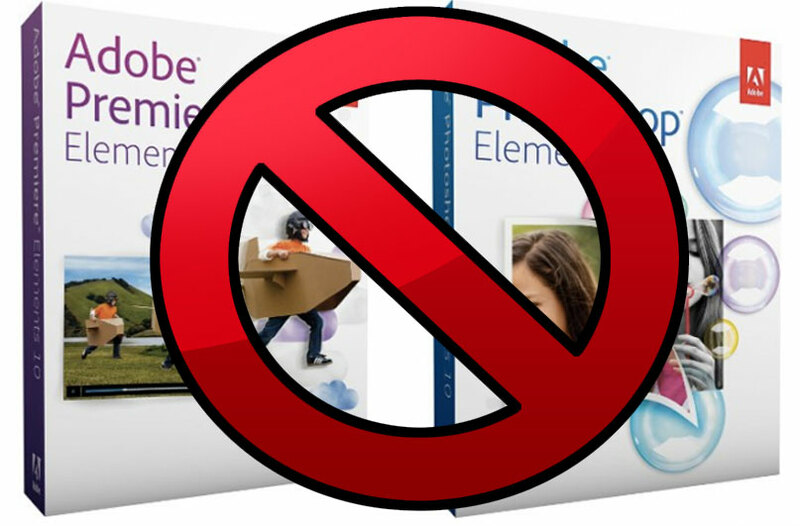 Adobe Australia is “pirating” Adobe US products with a considerable markup. Good on you John, I too considered buying these products, but it is joke (sick one) how the Aussie market of Adobe are trying to rip us off. Shame on Adobe!!!! You are so right the ‘scam’ we in Australia are subjected too. It not only applies to software, but hardware as well. When the new version of PHOTOSHOP is released I will upgrade from CS4 to CS6 (? ), but I will not be buying it from an Australian distributor. I am looking at upgrading my camera, a SONY A350, to the new SONY A77. The Sydney camera stores are advertising this camera at $1800, body only. A camera store in NY sells it for US$ 1400. Even with the exchange rate and postage it will be cheaper to buy ‘offshore’. The Australia retailers are grumbling that to many products are now beinf purchased online. We wouldn’t purchase online if the retailers were not so greedy. It is one of the most frustrating things when you know you are being ripped off. I just can’t believe the difference. I can buy Adobe Photoshop Elements 10 for $50 from US Adobe (currently on sale for 1/2 price until 29 November). In Australia I’m going to have to pay $132.50 for the download ($148 for the box). I’m assuming I cannot download the version from the States because I’m very tempted but surely if it was that easy when would Adobe Australia ever sell any? $82.50 difference is just unbelievable. I went to upgrade also and found this ridiculous disparity. I’ve had it in the past and just ordered thru the US site but now they are using geo-location so I can’t order from US. I even created a new account with a dodgy US address but during the payment they worked out it was an OZ paypal account and didn’t process it. So no upgrade on Adobe anymore…gunna have to find an alternative. Good on Tom! I actually did the same thing as it is actually one of the few avenues for contacting Adobe. I also wrote about it on as many blog posts I could find that reviewed the software. Adobe Australia are thieving bastards. Pirates. I just downloaded a trial of Photoshop CS5, from the USA site. The US pricing is $699, the Australian pricing is $1168. As I’m only using it for home purposes, the $469 difference is just prohibitive. As I downloaded the trial from the USA site, if I choose to buy I’d be paying Australian prices, for a USA copy of the software – there would be nothing “australian” about my copy of Photoshop, as all I need to do now (after purchase), is type in a registration code. I have no idea what “changes” they make to the Australian versions, if any (eg do they change color to colour, or is the default millimetres instead of inches???) Frankly, if I’m happy for my software to have an american “feel”, and to buy in US dollars, then that should be my choice. To charge me $469 more, for the exact same downloaded product, is just wrong. And they are laughing all the way to the bank. I had the exact same thing with buying GPS maps from Garmin. There is one download, doesn’t matter where you live, and when you get to the checkout the price is upped dramatically ($45). I contacted Garmin and they gave a lame excuse which focussed on our small Australian market and the differences in hardware. They don’t look at exchange rate at all. They completely ignored that it was software. We need to stand up and start yelling. Our Australian dollar is on par, or better than the American dollar, and for many things, like downloaded software, we are being ripped off, just because they can. The excuse of small market, extra costs involved etc, is a blatant lie when we are talking about software downloads from a central location. I so agree with you gents. 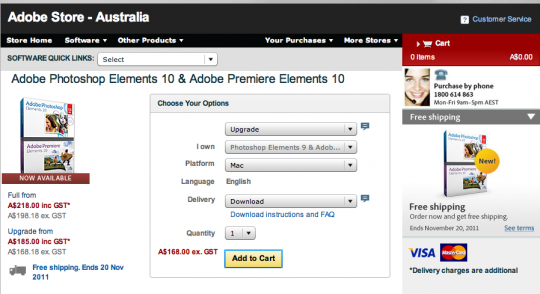 I too want to purchase Elements 10 but even going through Amazon for their special deal – it is prohibited to USA customers only – what a farce. Beyond a joke actually. That is not competition, its called ripping Aussies off blind like with all software and hardware from the US of A. Its a rip off. I am trying to buy their cloud suit and its US $50 per month and $62 for being in Australia. Also, they do not give you any option to change the currency to US, which unfair. Very unprofessional from Adobe to be such greedy. Fair Trade should be aware of such behaviour. You’re efforts to redress this iniquity is truly heartening; thank you sincerely of behalf of all the other “Adobe victims’ out here! I’m currently considering upgrading from Adobe P/S Elements 8 to Ver. 10. After past trauma with ‘amazon.com’ deliveries to my Australian address, at least they now highlight that by residing in Australia, delivery of an intended Adobe purchase/upgrade cannot be made to ‘your default delivery address’. P.S. With a surname of Larkin, I’m sure in a bygone age that you would have been labelled a “Larrikin”!! You are welcome Paul. I am still a “larrikin” ^_^, cheers, John. I’ve just stumbled across this site and have come a cropper just like everyone else. I tried to order PSE 11 via Amazon, but as others have done, I met a brick wall. Trying to contact Adobe is about as easy as learning nuclear physics ! Rip off Australia !!! Well I managed to get a genuine disc of PSE11 from Amazon UK, delivered for a total of $92.00. I’m really glad I got annoyed enough to punt around for it. Thanks for your efforts with Adobe. That is excellent Peter! Thanks for the heads up on that one! I’ve just noticed that Amazon UK now provides downloads of PSE, but only for UK customers. Sadly, there’s another avenue closed – and it was cheap too, GBP 38.25 with VAT off! So, it’s back to Adobe Aus with its hefty pricing of $130.